Quietly nestled in Brussels trendy Chatelain neighbourhood, just a few steps from the fashionable Avenue Louise, your are in the center of of entertainment, shopping and business and convenient public transportation to all over Brussels. The hotel features 107 magnificent accommodations. There is a choice of Superior Rooms, Executive Rooms, Junior Suites and Ambassador Suites all outfitted with a bold and engaging design, with full attention to detail. The custom furnishings, room amenities and hotel services, enhance the experience and strike the perfect balance between gracious hospitality, exceptional comfort and state-of-the-art technology. Extraordinary in both dimension and decor, these suites reflect privileges of Brussels' finest Boutique Hotels. Boasting Floor Plans of up to 140 square meters, all of Le Chatelain All Suite Hotel suites feature separate living and sleeping areas. The Ambassador Suites include a separate living room, a bedroom with a king size bed, a separate dining area, a large working desk as well as a vast and richly appointed marble bathroom with separate shower, Jacuzzi bathtub, hair-dryers, towel-warmers, bathrobes and slippers, a full range of luxury toiletries and a large terrace overlooking Brussels. They are luxuriously and elegantly furnished and endowed with the most innovative conveniences and upscale amenities such as a direct dial fax machine, modem and PC connections, ISDN-line, interactive satellite TV (40 channels) and much more. Spacious and comfortable, the Junior Suites is suitable for long stays. This suite features living area separated from the bedroom by a stylish glass wall. These Suites include King Sized Bed, large working desk, sofa bed, and are enhanced with the most innovative conveniences and upscale amenities such as modem and PC connections, ISDN-line, interactive satellite TV (40 channels), individually controlled air-conditioning, mini-bar, coffee and tea facilities and in-room safe, as well as state-of-the-art security and unequaled soundproofing. Executive Rooms also feature a large working desk and are enhanced with the most innovative conveniences and upscale amenities such as modem and PC connections, ISDN-line, interactive satellite TV (40 channels), individually controlled air-conditioning, mini-bar, coffee and tea facilities and in-room safe, as well as state-of-the-art security and unequaled soundproofing. The richly appointed marble bathrooms are equipped with hair-dryers, towel-warmers, bathrobes and luxury toiletries. These Superior Rooms boast stylish architecture and space that is both stimulating and relaxing. Enjoy either a king, queen or twin beds complete with plasma TV and mini-bar selections. The Superior rooms are elegantly furnished and endowed with the most innovative conveniences and upscale amenities such as modem and PC connections, ISDN-line, interactive satellite TV (40 channels), individually controlled air-conditioning, mini-bar, large working desk, coffee and tea facilities and in-room safe, as well as state-of-the-art security and unequaled soundproofing. Refreshingly large, Executive accommodations blend all the comforts of home with the lavishness of a deluxe boutique hotel. A room size of at least 45 square meters, a king or queen size bed or two twin beds, a sofa bed, a seating area differentiate the Executive Rooms from the Superior Rooms. 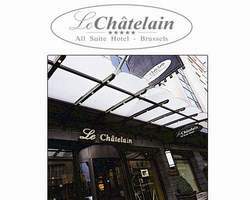 Brussels boasts thousands of places to eat, many of which are consistently voted as the best n the Europe and conveniently, for Le Chatelain All Suite Hotel guests in the evening "La Maison du Chatelain" sets the tone. This chic restaurant offers elegance, refined taste and a touch of exclusiveness that are gathered in this new highlight of Belgian and French gastronomy. 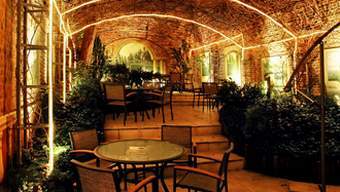 Guests will experience a myriad of culinary experiences in this chic and intimate restaurant. Le Chatelain All Suite Hotel Chef wonderfully succeeds in combining traditional cuisine with the refinement of Asian gastronomy, particulalry her select favorites dishes influenced by the Pacific Rim region. Set within a casual but stylish setting, Bartist provides the perfect setting to start off your day, offering classic continental and full service as well as sumptuous self-service breakfast buffets. Throughout the day, B'artist evolves to keep pace with guests' tastes and needs serving special business and private events. During the warmer days, the beautiful garden terrace inspired by the Florentine inner courtyards, invites you to relax and dream away whilst enjoying your tea with pastry, an afternoon drink and even a full meal from the La Maison du Chatelain Restaurant. From a light snack to a gourmet meal, guests can enjoy the fine food of Le Chatelain in the privacy and relaxing comfort of 24-hour in-room dining. Knowledgeable in the ways of business, we understand that success and productivity is often driven by the tone of a meeting. The lighting, sound, seating and privacy all contribute to the perceptions of those gathered. We have given great thought to these and other details. And go to great lengths to make it feel like your meeting is the only meeting. It shows in Le Chatelain All Suite Hotel stylish, elegant meeting facilities and in Le Chatelain All Suite Hotel incomparable service and discretion. When the goal is prestige, Le Chatelain is the solution. Perfect for banquets or any occasion worth celebrating, Le Chatelain All Suite Hotel Function Rooms include an elegant lounge and bar for cocktail receptions. Meeting facilities are equipped with state-of-the-art teleconferencing technology, LCD projection television monitor, high speed Internet access, fax machines, built-in speaker systems and electronic screens. Other meeting amenities include fully-equipped kitchen facility. 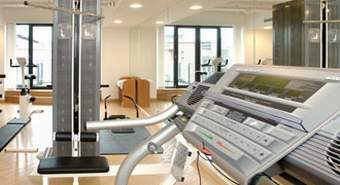 Le Chatelain All Suite Hotel state-of-the-art fitness center featuring Techno-Gym equipment is exclusive to Le Chatelain All Suite Hotel guests and residents, offering free weights, circuit training, cardiovascular equipment. We've positioned televisions with personal remote controls and headphones in front of the machines for your convenience. Upon request, the fitness center can also provide you with a comprehensive fitness evaluation and personal trainer.